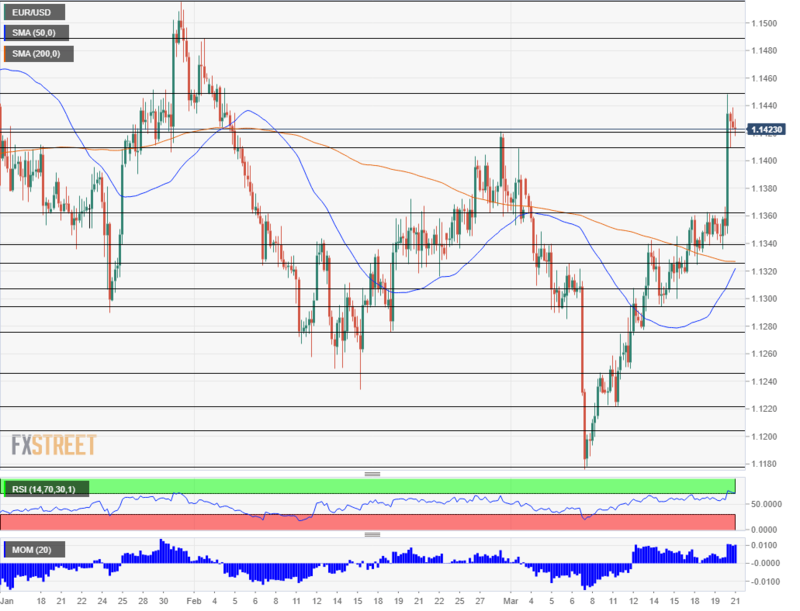 You are at:Home»Forex News»EUR/USD: Just a correction on overbought conditions or is worse? EUR/USD: Just a correction on overbought conditions or is worse? EUR/USD is consolidating its gains after shooting higher on the Fed’s dovish decision. Brexit and further Fed reactions will likely move the pair. The four-hour chart shows the pair is still overbought, but the Golden Cross can change the picture. EUR/USD is trading comfortably above 1.1400 but above below the fresh six-week high of 1.1448 reached on Wednesday. The dovish Feddecision woke up the pair from its slumber. The world’s most powerful central bank slashed its interest rate forecasts to no rate hikes this year, down from two it indicated in December 2018. Moreover, the balance sheet reduction program is due to end in September after it will be tapered down in May. Employment, inflation, and growth forecasts were cut as well. Chair Jerome Powell added fuel to the fire by saying that the data does not suggest an interest rate move to one way or the other, opening the door to a rate cut. The US Dollar tanked across the board on the decidedly dovish stance, but it is now attempting a recovery, which seems like a “dead cat bounce” for the greenback. Will the greenback resume its falls? The fall in US 10-year Treasury yields to around 2.50%, and the flattening of the yield curve may raise concerns of a recession or a downturn in the US. “When the US sneezes, the world catches a cold,” goes the saying. The US Dollar could benefit from a risk-off environment. Apart from further reactions to the Fed, EUR/USD may move on Brexit developments. The UK officially requested an extension to Article 50, or a delay of Brexit, until June 30th. PM Theresa May blamed Parliament for the postponement and asks them to approve the accord before the current Brexit deadline on March 29th. The EU reportedly wanted either a short extension to May 23rd or a long one until the end of the year. Brussels may insist on May 23rd or the 22nd. EU leaders will meet May in Brussels for a planned EU Summit, and it is unclear if any decision will be taken. A Brexit delay could wait the very last minute. In the old continent, the European Central Bank will release its bulletin, but this usually just repeats known messages from the recent rate decision. The Relative Strength Index on the four-hour chart is around 72, just above 70, thus still indicating overbought conditions. This implies the correction has not ended and the pair may fall a bit more before resuming its rise. Bulls may be encouraged by the Simple Moving Averages. The 50 one is about to cross the 200 one, triggering the “Golden Cross” pattern which is bullish. Momentum is also upbeat. Initial resistance awaits at 1.1420 which was a peak in late February. The fresh high of 1.1448 is a critical line to the upside. Further above 1.1485 and 1.1515 await EUR/USD. They capped it earlier in the year. 1.1410 is still fought over. Below, the stubborn resistance line of 1.1360 turns into support. 1.1340 was the bottom of the range before the move higher, and 1.1320 is the confluence of the 50 and 200 SMAs.